The facelifted Maserati Quattroporte will make its world motor show debut at the Paris Mondial de l'Automobile at the beginning of next month and will follow that up quickly with its Australian debut at the Sydney Motor Show. 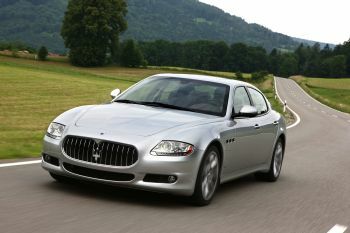 The Maserati Quattroporte, arguably the most important car produced by Maserati during its legendary history given the sales and profit transformation that it has delivered, will see the recent facelifted version making its motor show debut at the Paris Mondial de l'Automobile next month (2 October 2008) offering refinements its exquisite shape and new technology under its skin. A little over a week later Australian and New Zealand will have its first look at Maserati’s new luxury performance sedan when it is unveiled at Australian International Motor Show in Sydney on 9 October, prior to deliveries starting late this year. Described as a Maserati masterpiece for its bold, glamorous looks which are matched by its driving performance, the Quattroporte is the most successful Maserati of all time, have delivered a new level of performance motoring to 15,000 owners around the world and collected 46 international awards. The success of the Quattroporte in defining a new market sector for a high performance, exclusive, luxury sedan with unique styling from a marque renown for its sporting performance has lead other manufacturers to attempt to imitate the Quattroporte, but before those cars arrive from Maserati’s imitators, the Italian car maker has produced a subtle but detailed reworking of the Quattroporte. Thanks to Pininfarina’s unrivalled and skilful hand, the Maserati Quattroporte is being refined in a fresh and modern way, which remains always mindful of the class, glamour and exclusivity which characterise the Maserati Quattroporte’s style. 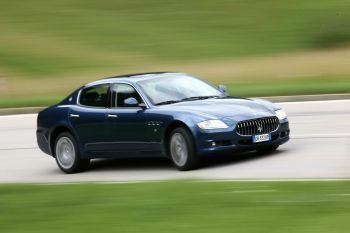 The personality and glamour of the Maserati flagship are now represented by two models that expand the Maserati sedan’s range: the Quattroporte and the Quattroporte S.
The former is fitted with the familiar 4.2 litre 400 Hp V8 engine, while the latter adopts the new 4.7 litre 430 Hp V8 recently introduced on the GranTurismo S, and which will offer distinctly different specification. Both cars have the six-speed automatic transmission developed in association with ZF that blends effortless performance that can be turned into aggressive performance driving at its best at the flick of switch and an increase in pressure on the accelerator pedal. The main styling changes are to the most recognisable features. Firstly, the front, where the new grille, with its vertical slats, is reminiscent of the GranTurismo. The front and rear light units are also updated, featuring LEDs, enhancing both appearance and safety. On the side, the under-door moulding is more noticeable, with a line that runs into that of the new bumpers, which have a wider protective band and more pronounced rear styling. The door mirrors are also new, with a more dynamic shape and a more streamlined mounting to the door. The interior has a new central console; the controls are grouped more closely together for even more convenient operation. The car’s range of navigation systems is also fully updated, now comprising the New Maserati Multimedia System. 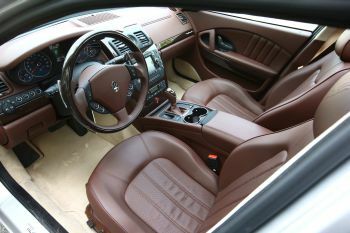 Two new shades of leather, Marrone Corniola and Sabbia, replacing the beige which was previously in the range, debut on the Quattroporte S and Quattroporte respectively.